The Molecular Devices SpectraMax Plus 384 Microplate Reader brings you fast, and precise readings with a full spectral range across a variety of formats. The optical system of SpectraMax Plus 384 Microplate Reader is built around a monochromator, which allows for selection of up to six wavelengths at a time for absorbance detection in the UV-visible wavelength range (190 nm - 1000 nm). This UV Vis microplate readers operates as both a standard spectrophotometer and a microplate reader. The patented multi-channel optical design of the SpectraMax Plus Absorbance Microplate Reader mimics a dual beam spectrophotometer, measuring each sample in the plate directly, eliminating measurement error due to variations in light output between optical fibers on other instruments for more reliable data reporting. The nine-channel system delivers both high precision and speed when reading cuvettes, 96-well microplates for endpoint measurements, kinetic assays, and spectral scans. Narrow bandwidths of this microplate reader deliver increased measurement accuracy and linearity over the widest range of assays, including DNA quantitation in the UV range. The Molecular Devices SpectraMax Plus is a standard for UV-visible microplate reader absorbance, providing ultrafast, full spectral range detection for cuvettes, 96-well microplates, with the only temperature-independent method for path length correction. This MDS SpectraMax Plus 384 is excellent conditionand comes with current validation reports. All of our lab equipment comes backed with our standard warranty. 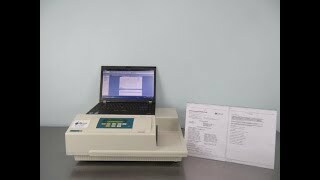 If you have any questions about this used Molecular Devices microplate reader, please dont hesitate to contact us.